This section was created over fifteen years ago at the initiative of anglophone parents, with the goal of welcoming students who were bi-lingual in English and French. There are several accredited international sections in France (both British and American) but this is one of the few located in a public school. 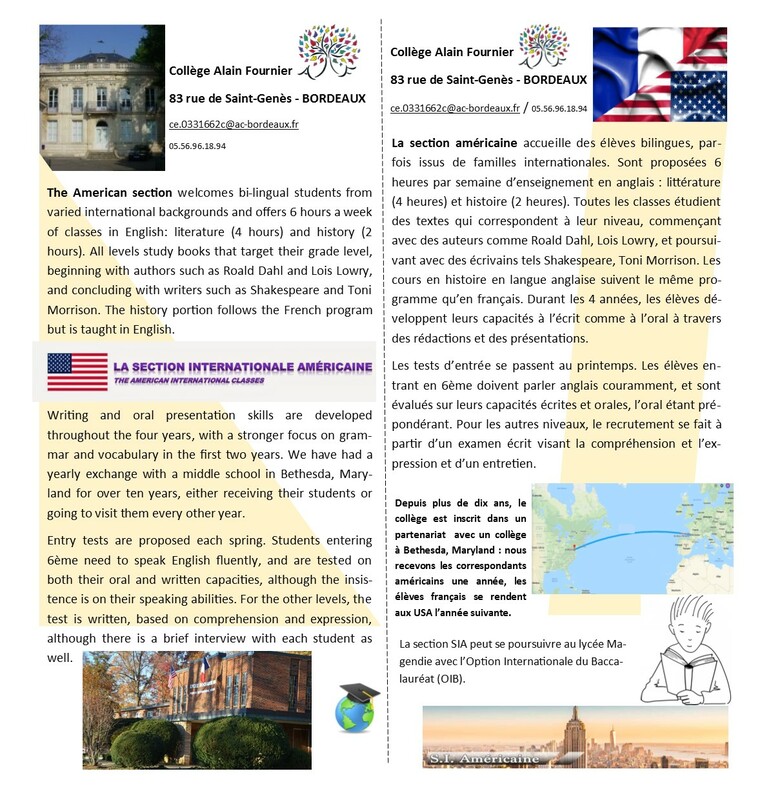 The final goal of the section is to have a Brevet with the special mention of an Option International, as well as to serve as a conduit to the American section in the Lycée Magendie in Bordeaux. Students can enter the section at any level, and there are yearly tests to determine the competence of students in English as well as to verify the global scholastic level of each student. Due to the extra hours required in the section (4 hours of English/American Literature and 2 hours of History taught in English), students need to be motivated and comfortable in all of their subjects, as well as possessing fluency in English. While the majority of our students have at least one anglophone parent or have lived abroad, there is a smaller percentage of students that have a high level of English without an anglophone background and who successfully integrate the section. This mix of cultures and knowledge makes for a dynamic and stimulating classroom atmosphere and the students themselves develop strong bonds through their shared experiences. The curriculum focuses on reading comprehension (including grammar and vocabulary), oral participation and a progression of the skills needed to write well-organized essays and give oral presentations. In the literature section, each grade level reads books adapted to that learning level: for example, Roald Dahl and Nathalie Babbit in 6ème; Edgar Allan Poe, Jack London and Robert Louis Stevenson in 5ème; John Steinbeck, Ray Bradbury and George Orwell in 4ème; William Shakespeare, J.D. Salinger, and Harper Lee in 3ème. In History, the students follow the French program, albeit in English, with their Geography lessons taught in French. Every two years the 4ème participate in a school trip to the United States, where there is an established exchange with a school in Washington D.C. After a week in their host families, we continue on to New York for three days to complete our visit. Likewise, the American students come to Bordeaux on alternate years and stay with families here before going on to Paris as part of their voyage. Test dates and deadlines for submitting dossiers are posted on the website of the collège well in advance; in general the tests occur in May.